We rented a vehicle that can comfortably fit five, but can take up to 8 passengers (because we were expecting that much joiners). The plan was to leave Makati at 8 am, but due to a nasty unexpected heavy traffic in the Cubao area, we ended up leaving at 9 am (guess who’s late. *annoyed*). The traffic at the South Luzon Expressway (SLEX) was surprisingly moderate. There were areas where was a congestion, due to the ongoing road works, but it was a pretty pleasant drive south for a Saturday morning. It was almost 11 o’clock when we got to Tagaytay’s main highway. We turned left from the road from Sta. Rosa to go up to the People’s Park in the Sky. We drove and drove and drove, going up until we reach the entrance. There were several vehicles already parked at the entrance and as we got down, we were met by hawkers selling food, souvenirs and touts for boat rentals in the lake. The entrance to the park was Php 15 per person, and for an additional Php 200, you can rent a jeep for the whole group to take you up to the peak. We opted to walk, as it seemed like a short distance. It *was* a short distance, but it was all uphill, so there was much grunting and complaining on the way up. There were rest stops along the way and you can sit down to catch your breath or take photos of the amazing view. We finally reach the peak and took even more photos. 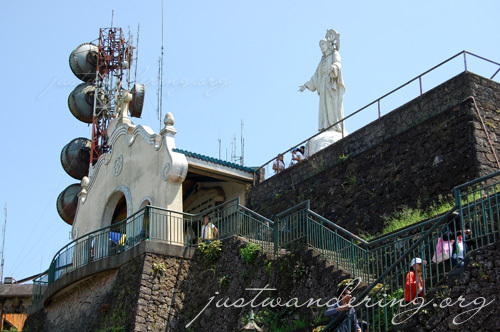 There was a small chapel at the peak, but to reach it, you’d have to go up a flight of stairs. We opted to just stay at the ground level and go around the perimeter of the property. Unlike the Picnic Grove, there’s nothing much that you can do at the People’s Park in the sky. There are no picnic tables, no hiking trails, horses, ziplines or cable cars. On the other hand, there are no touts or hawkers inside the park, and there are less people, which makes it a pleasant alternative to Picnic Grove. 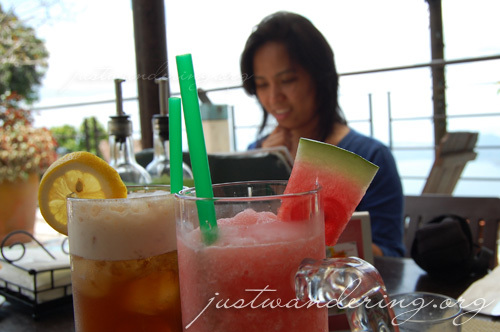 Enjoying Buon Giorno’s fresh fruit shakes while deciding which pasta to order. That’s Rael in the background. We didn’t stay long in the park, as we had to rush down to get a table to Buon Giorno for lunch. This Italian restaurant inside the Cliff House compound along the ridge is very popular and you need a reservation if you want good seats. Since we didn’t have any reservations, we had to go there before the lunch rush to get good seats outside. The drive down to was fast, and in four minutes, we were already at Picnic Grove. Another five minutes, and we were at the Cliff House. We were relieved to see that the parking lot wasn’t filled yet, but there was a photography club taking photos inside the property. We quickly made our way to Buon Giorno, and upon spying an empty table outside, I zoned in to the nearest server and asked if we can have that table. He asked us if we had reservations, and we told him we didn’t. He checked wit the host, and luckily the table was available, much to the consternation of the ladies who was five seconds too late as it was the last available table. Lunch was filling and very good. We enjoyed the pastas and the pizza, as well as the refreshing fresh shakes. 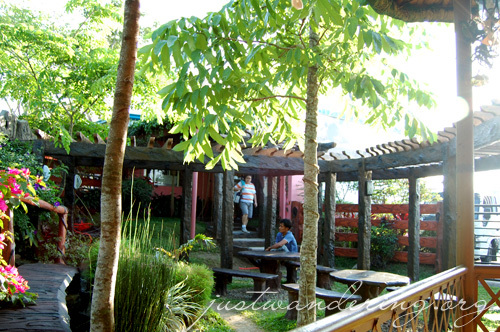 Tagaytay is one of the places where dining al fresco beats dining inside the air-conditioned area on a hot summer day. The view was spectacular, the air was fresh and the company was simply marvelous. After settling the bill, we stayed in the Cliff House, taking photos of our dolls among the plants in the central courtyard. Our driver picked us up at the carport. He was so concerned about the exorbitant parking rate (Php 100 per hour, but free if you have a validation ticket), so he just dropped us off and he went out again to get lunch outside. We turned left when we excited Cliff House, to go to Sonya’s Garden. I’ve only heard of Sonya’s Garden from my sister, who has been going on and on about it since 2004. This is my first time to go there, and I’m happy to finally be able to see it. Lunch at Sonya’s requires reservation, but you can go around the property if you’re buying something from the Panaderia and the Country shop. Sonya’s Garden is every gardener’s haven. I’m not one for gardening, but I appreciate the lovely shades of green and colorful flowers all around. 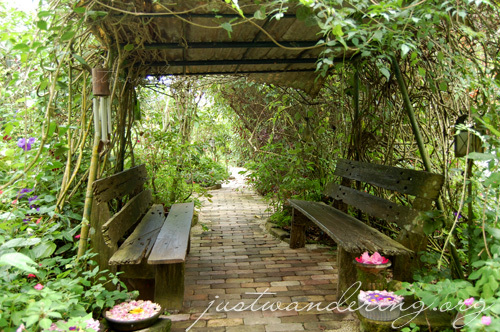 There are plenty of shaded area and benches where you can sit and enjoy the peace and quiet. We stepped into the Panaderia, and our nostrils were welcomed with the pleasant smell of freshly baked bread. Rotch was under strict instructions to buy some cheese hopia, and all of us bought a pack to try it out. The Country shop sells several souvenir items, like organic soaps from Ilog Maria, re-usable shopping bags, jewelry and other trinkets, even fresh greens and veggies from Sonya’s own garden. From Sonya’s Garden, we drove back towards Tagaytay and stopped at Bag of Beans for coffee and pie. I’ve been a fan of Bag of Beans since I first went there last year, and I always make sure to drop by every time I’m in Tagaytay. Bag of Beans serve local Barako coffee, and other yummy drinks that go well with their savory meat pies and desserts. As we were getting a table, we met Tita Batch, Bag of Bean’s new manager. She’s such a cheery character, and she personally attends to the guests in the garden cafe. She was so thrilled to see us with our dolls, and she even sat with us to play with them. As we were leaving, she walked us to the deli, where we picked up some fresh raisin bread and frozen steak and mushroom pies. The vehicle rental was for twelve hours. Taking the traffic back to Makati in account, we had to leave Tagaytay before six in the evening. Our last stop was Rowena’s, upon Camille‘s recommendation. Rowena’s is located along the highway that comes from Sta. Rosa. It’s hard to miss it, as the building is painted a bright pink. Rowena’s is a one-stop souvenir shop in Tagaytay. Aside from buko tarts and pies, they also have cheese tarts, which are mini cheese cakes, chocolate mousse tarts, sylvanas, lemon bars and brownies. They also have a large selection of dried seafood, as well as other native delicacies — barquillos, shing-a-ling, banana chips, and even crispy pili nuts. Aside from the store, they have a small cafe where you can sample the pies that they sell, and eat it in the air-conditioned area or out in the garden. The Pinky Street contingent. Pay no heed to David. After sampling the tarts in the garden (that didn’t sound right), we went back inside the store and paid for our souvenirs. The ride down from Tagaytay was as uh, painless as our ride up. Traffic was light to moderate. Traffic in the SLEX was pretty good, as the parts that was closed several months ago are now open. There are areas where traffic build up, but we made it to Makati with time to spare before our rental reached 12 hours. All in all, it was a great day spent with friends. We were able to visit all the places we wanted to go to, without having to rush on each stop (except when we had to go to Buon Giorno). Here’s a breakdown of our expenses for this road trip, so you have an idea how much you need to set aside for your own Tagaytay day trip. Bear in mind that is a very very generous amount. I went all out and bought a bunch of food stuff for my family. Pizza and pasta at Buon Giorno costs between Php 200 and Php 300 each. Sonya’s Cheese Hopia costs Php 80 for a pack of 10. Meat pies at Bag of Beans costs around Php 100 each while drinks vary from Php 90 to Php 130. A box of buko tarts (9 pcs) and cheese tarts (6 pieces) costs Php 160 each. Hey, where did you rent the van at? Am curious as my mom wants to know of some reputable drivers next time she goes to the Philippines and needs a driver. She definitely wants to go back to Tagatay for a day visit. Van cost is reasonable. Does it have aircon and did it come with the driver? @ajay: yes, it came with AC (i doubt anyone in their right mind would hire a van without :D) and a chauffeur. 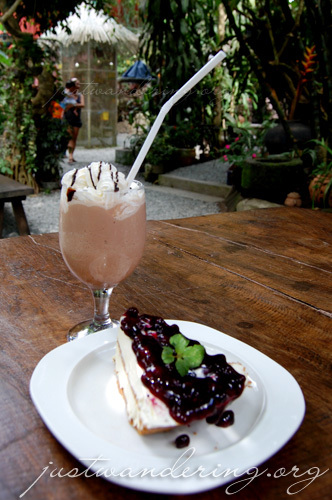 I’ve been to tagaytay many times but i haven’t been to sonya’s garden! haha! Ajay: Haha, onga eh, napapadalas na ko sa Tagaytay! And I can’t wait to go back again! we are 5 adults and 1 baby (2 year olds) plan to visit Tagaytay on early July, can you place recommend your reputable van driver to us. 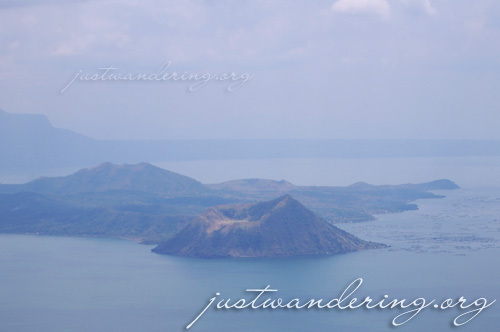 Thanks in advance…..
Wow, I’ve definitely got to put Tagaytay on my list of “places to see before I die.” Prices aren’t too bad either and the view is gorgeous. I can’t believe this place isn’t swarming with tourists. …and I would be happy sampling delicacies from EVERY food stand and restaurant. 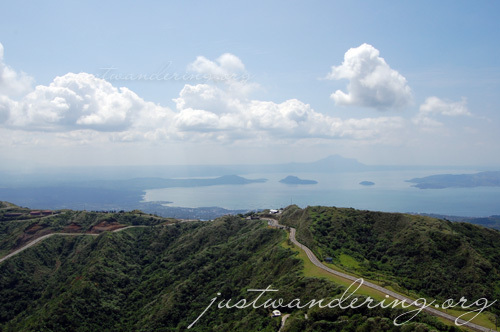 And yes, you have to go to Tagaytay when you come to the Philippines! Nina: Yes, could you email it to me? That would be lovely! That way, my mom will have it on hand when she goes for another visit. She never knows what van service to use that is reputable. Thank you! I’m also interested in the contact details of the van and driver. If you would please email it to me, I’d be grateful. Hi, I’m from Malaysia. Will visit to Manila soon. 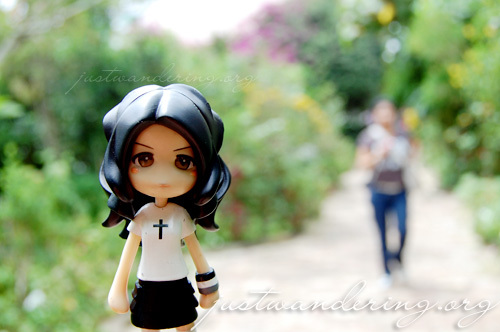 One of our stop by place is Tagaytay. Could you please provide me the contact of the Van driver? Thanks a lot. Hope to hearf rom you soon. I have been planning to do a tagaytay day trip for the longest time, your blog has just decided things for me, tagaytay is very nice! Can I also get the number of the van rental services? The driver also seems mindful of the time and expenditure which is nice for budget conscious travellers! Hi, I got curious with the van that you hired, could I ask for the contact number? Thanks in advance. Hi, I guess i’m one of the people who wanted to know the contact details of the van you hired. Could you send it to my email too. I would appreciate it. Thanks in advance. Thanks for your blog, I especially appreciated the list of expenses since it helps me plan my budget for a trip to Tagaytay. I was thinking of going on Monday, would you be able to give me the name and phone number of the van you had reserved for 12 hours? Thanks so much. can i please have the contact number of your van rental? Thanks and i hope to hear from you soon! Can I have the contact info of the VAN HIRE. Thanks! Our driver is Amang and his mobile number is 0917-8827719. That’s his number from back in 2009 pa, not sure if he’s still using it since we haven’t contacted him since then. hi! could u send me the name and contact number of the van. sounds a good deal! corrinalarra86@yahoo.com.ty! Been reading all comments,my name is Dan.I’m doing van service too.I can offer tagaytay for 2.5k PER DAY.fuel,toll fees,parking not included.if interested,you can reach me thru 0933 913 1217,0928 258 9471.my passion is travelling and would love to share info to all. Wow, these are the top 3 restaurants that I would want to try at Tagaytay. I would really love to eat at Buon Giorno those shakes looks so deliciously colorful and cool. When budget permits, hopefully. In the meantime, I tried those blueberry cheesecakes too in Bag of Beans. Yummy adventure! My sister held her wedding in Tagaytay last month and the place was really beautiful! 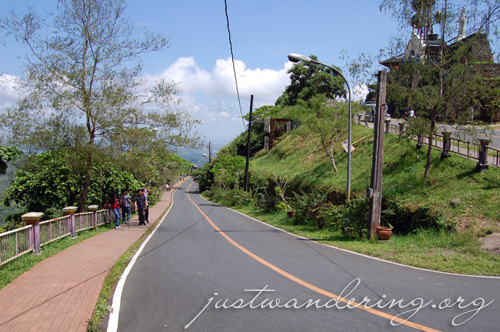 You may visit Tagaytay using Private van for hire, Advantages? Visit places as many as you can for one day. Best place for getaways with family or friends. I really love Tagaytay! Hello, pwede po ba mahingi yung contact nung sa Van na ni-rent nyo? Thank you. Hi Shiela, you can contact Kuya Amang at 0917-8827719. I can’t verify if that’s still working though, as it’s been years since we last hired him.